Traveling with kids? Let the kids have some input and travel like a pro! As soon as our kids could pull a suitcase or carry a backpack we always included them in the travel experience by having them take responsibility for at least some of their own gear. Especially in an airport this can make your life easier but be prepared to offer a hand if your child gets tired of carrying the items you’ve given them. My priority is to ensure they learn to love traveling not dogmatically make them carry their own gear. Packing a Suitcase – Always pack things they like to wear. It’s no fun to have a suitcase full of clothing or shoes and have your child say they won’t wear them, so avoid this issue and pack what they like. Better yet, give them a list of things they need to pack [you can alter this list based on your child’s age/ability] and help them identify the items they love to wear – and pack those. Always pack an extra set of clothing and a little more warmth than they kids think they will need. 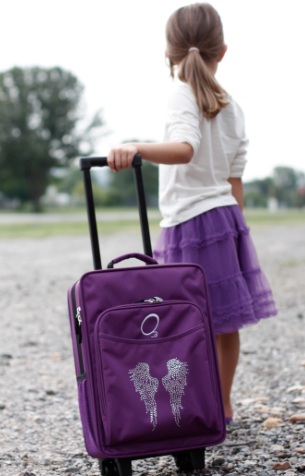 You can find child size suitcases at a local department store, Target, Amazon.com or at high end travel stores such as Patagonia.com. Packing a Backpack – The backpack has the items your kids need to have with them for comfort [e.g., a bankie or other cuddly toy for comfort] and for entertainment. The pack should be their size and fit comfortably. This is true if you are packing for a car ride or an airplane ride. When our kids were young we had things we always did for them like wrapping a few new toys for them to unwrap in the airplane. These can be simple, but engaging. Now we never leave the house for a trip without a sketchbook, art supplies, and an iPad [preferably loaded with a movie and some games since you cannot count on wifi on planes and certainly not in the car]. We also like to pack things like a hackysack or soccer ball for when we land or on a layover. Entertainment is key! You can find child size backpacks at online retailers such as LLBean.com. I like these because they last forever! You can get fancy and have their initials or name embroidered on if you have time. The younger kids love this! Please share any packing and travel tips! Enjoy your family travels!